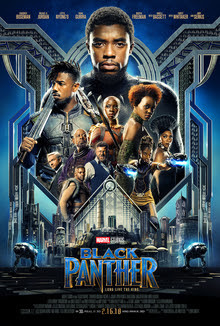 The eighteenth film in the Marvel Cinematic Universe, based on the Marvel Comics character Black Panther. Chadwick Boseman reprises the title role (who first appeared in 'CAPTAIN AMERICA: CIVIL WAR'), and the movie costars Michael B. Jordan, Lupita Nyong'o, Danai Gurira, Martin Freeman, Daniel Kaluuya, Letitia Wright, Andy Serkis, Winston Duke, Angela Bassett and Forest Whitaker. It was directed by Ryan Coogler, who also helmed the critically acclaimed hits 'FRUITVALE STATION' and 'CREED' (which also both starred Jordan), and it was written by Coogler and Joe Robert Cole (based on characters created by Stan Lee and Jack Kirby). The story revolves around the African superhero returning home to the nation of Wakanda, where he is now king, but his leadership is challenged by a new enemy. The film has received nearly unanimous positive reviews from critics, and it's being called (by some) a revolutionary cultural movement (in much the same way that 'WONDER WOMAN' was last year). It's also projected to break records at the Box Office, and become Marvel Cinema's biggest hit to date. I really enjoyed it as well. The story begins right after the end of 'CAPTAIN AMERICA: CIVIL WAR', with T'Challa (Boseman) returning home to the African nation of Wakanda. Since his father was killed, T'Challa is named the new king of Wakanda. At the same time a Wakandan exile, going by the name of Killmonger (Jordan), has aligned himself with a South African black-market arms dealer, named Ulysses Klaue (Serkis), and is plotting to overthrow T'Challa. T'Challa, as the superhero Black Panther, attempts to stop Klaue from stealing more vibranium (while unaware of Killmonger's involvement). Two female special forces agents (Nyong'o and Gurira), CIA agent Everett K. Ross (Freeman), and T'Challa's teenage sister Shuri (Wright), all end up aiding him on this mission. I have to agree that this is one of Marvel Cinema's best movies, and I think it's cultural significance (and popularity) is really inspiring too. While I don't think it's quite as good a film as 'WONDER WOMAN' is, it's still a masterpiece in it's own right. It's great that superhero movies (in general) are becoming such a respected, and revolutionary art form too. Haters will of course still hate the film (as they did 'WONDER WOMAN' as well, and anything that creates such powerful progress like this), but everyone else should definitely enjoy it (unless you just really hate superhero movies). The action scenes are spectacular, the performances are all good, the humor is clever and witty, and the dramatic scenes are moving (and briefly touching too). Coogler once again proves what a talented director he is, and he appears to be the perfect filmmaker for this important movie.